Features: Over 30 color options for lighting up the top hat! A remote was included to allow the user to control the light show from up to 20ft away. The lights have fade, strobe, and steady on functions for all colors. Fun Fact: This was my first official commission! 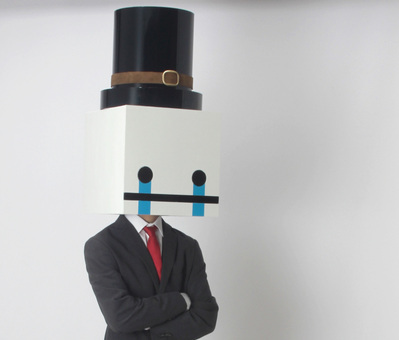 Hatty Hattington, the protagonist from the video game Battle Block Theater, is a unique character who has a box shaped head and is under the influence of the top hat he wears. This top hat, which has powers of its own, glows as it puts Hatty under its influence. While I've never personally played Battle Block Theater myself, I was very excited to have this project become my commission piece. This prop would challenge problem solving and fabrication techniques that would ultimately expand my skill sets for future projects. This project was my first project that utilized a lot of sintra, also known as PVC foam sheets. These plastic sheets are heat formable and durable, yet also light weight. The sheets come in various thicknesses and can be easily bonded with super glue or epoxies! The top hat for Hatty Hattington is controlled by a remote control that can be operated by a friend at a distance. This can give the impression of the helmet possessing "magical powers" as the hat can cycle between 30 colors and perform various color changing effects! For a full build write-up, check out the Hatty Hattington build post here!